Small Business Sunday (#SBS) Event 2019! Back in June last year I was lucky enough to have my business - Woof & Wilson, chosen as a Small Business Sunday (#SBS) winner on Twitter by Theo Paphitis, entrepreneur and former dragon on BBC programme Dragons's Den. Earlier this week on the 12th of February I attended the annual SBS winners event. As a new winner I was able to collect my certificate and have my photo taken with Theo. The cheesy grin on my face probably tells you how chuffed I felt about this! These numbers made me feel rather proud! The event was full of informative presentations and 1-2-1 sessions, as well as it being a great opportunity to meet and network with other small business owners. A particular highlight for me was listening to guest speaker Raja Saggi, Head of SME Marketing at Google UK. If you're like me and are totally baffled by how to get the most out of Google for getting your business out there, this was incredibly interesting and helpful. I was actually quite nervous before attending this event. I'm never very confident when it comes to a large event full of people I don't know! I needn't have been worried though, as I found everyone really friendly, helpful and supportive. 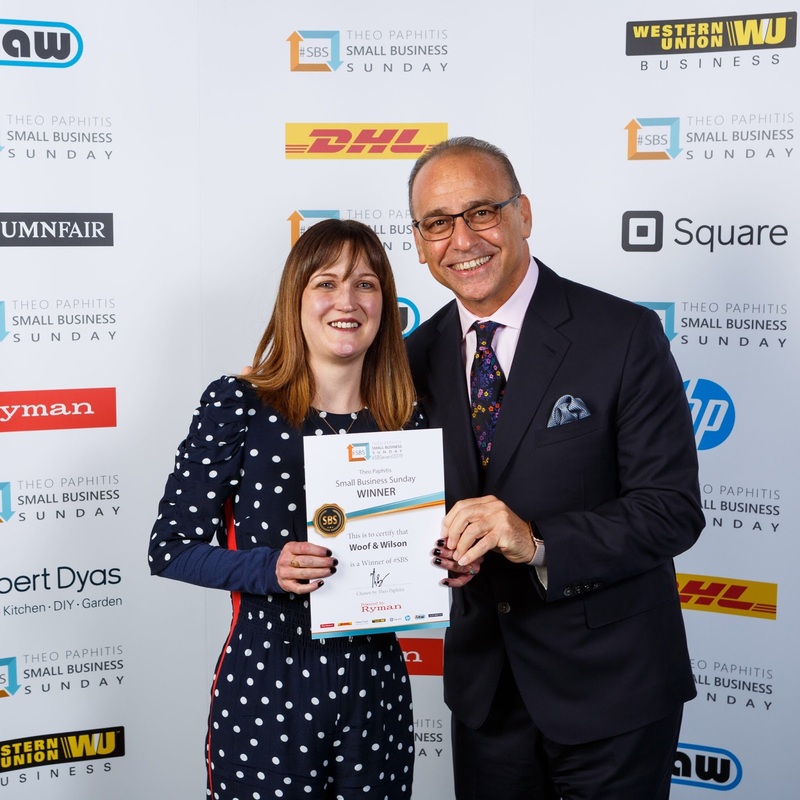 A big thank you to Theo Paphitis and to all the SBS crew for such a great event, and for supporting and acknowledging us Small business owners and the hard work we put in to make our make our businesses a success. I'm now already looking forward to attending again next year....can't wait! Well we are about to say goodbye to 2018 and welcomed in the New Year. I won't lie 2018 has been a really tough one. My Mum was going through treatment for her breast cancer and I've had endless problems with my health, mainly down to my congenital heart defect and was hospitalised several times over the past six months. It all took quite a toll on my mental health but I've been working hard to control my anxiety. Thanks to love, support and help from family I feel like I'm winning! However, this wasn't meant to be a negative post and it's important to remember the highlights of 2018 too. My youngest sister got married back in February, which was absolutely beautiful, and although my Mum had a tough time with her treatment the year is ending with us knowing that the cancer has gone! Best news ever! So I'm beginning 2019 with optimism and hope that it will be a healthier and generally easier year than the last. With regards to my business, I'm excited about all the plans I have to grow Woof & Wilson this year. I have new products planned that I'm currently designing and can't wait to be able to bring them to life. Along with my Woof & Wilson Designs greetings cards & gift tags I have now added my new tea towels to the collection. They currently come in four designs (shown above) and are a beautiful addition to a modern country kitchen, or for anyone who loves nature. You can find the tea towels here. There is also a small discount if you are buying two or more of them by using the code TEATOWELDEAL at checkout. I also hope to design and make some more of my machine embroidered pictures as they were a little neglected while I was unwell. I'm planning on expanding my range of stationery too so watch this space! It just remains for me to thank you all for sticking around and continuing to support my little business during such a difficult year. All the support I've received through comments, likes and shares on social media is so appreciated. Every sale on my website, no matter how big or small ALWAYS makes me want to do a little dance around my studio and helps me continue to build my dream. I also wish to thank all the incredible NHS staff who have helped my Mum, myself and other family members through some tough and scary times. You are all amazing! Thank you from the bottom of my slightly dodgy but full of love heart. Have the happiest of New Year celebrations and a wonderful 2019! I'm a Small Business Sunday (#SBS) winner! I had an exciting little victory happen a couple of weeks ago which I thought I'd share with you on here. On Monday 25th June I became a Small Business Sunday winner! For those of you not familiar, #SBS as it's know on Twitter was created by Theo Paphitis (yes, the Theo Paphitis from Dragons' Den). Every Sunday evening between 5pm - 7.30pm small businesses can tweet about their business, making sure they include the important #SBS tag and Theo will pick six of those businesses each week that he believes deserve a retweet, announcing them on the Monday evening. Obviously this is a great boost to any small business! On that Monday evening I was actually busy packing to go in to hospital the following day when I heard my phone keep pinging. It was my Twitter account going crazy as I had just been announced as a winner along with the other five businesses who also won that evening! To say I was over the moon was an understatement. I felt so honoured to have been chosen, it felt like a real pat on the back. When you are working so hard to build up your little business, that sort of recognition means so much! I had plenty of time while I was in hospital to try to respond to all the tweets and kind messages I received. I've been in and out of hospital twice in the last two weeks, which is why I've only just had the chance to writing this blog post now, (I'll leave the hospital story for another post) but I'm still feeling very proud that I'm able to display this winners badge on my website! Thank you Theo Paphitis! If you run a small business, make sure you join in over on Twitter on a Sunday evening. Good luck! Hello! Can someone explain to me how it's June already? That dreaded word "Christmas" will soon be popping up in conversations (alright, I love it really). Anyway, back to now....The beautiful, although at times stormy weather has meant we have managed to do a few jobs in the garden. I say "we", when we all know that Mr Woof & Wilson has to do all the actual labour while I merely give helpful hints (give instructions) and oversee the aesthetic side of things. At the end of last year we had new flooring put in some of our house, and we still had the wooden pallet it had arrived on. 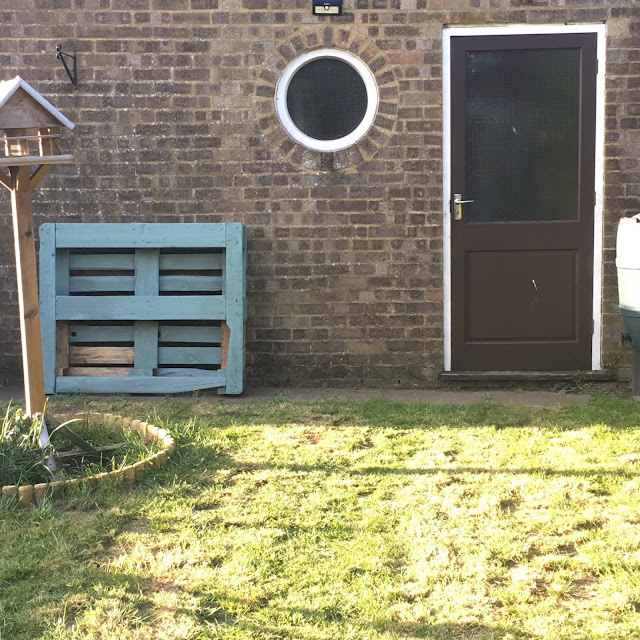 It had been a fairly unsightly mess on our patio (although the dog loved sitting on it to gaze over his garden) until a couple of weeks ago when we decide to do something with it. Mr W&W decided he could turn it into a stand for some of our pots of herbs and flowers, which he'd fix to our fence on the patio. I loved the idea and we began talking about paint colours. 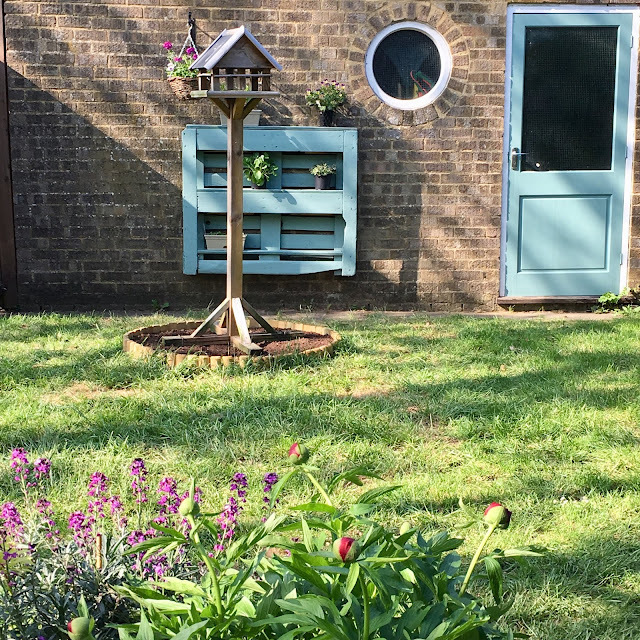 I realised that if we painted it a nice bright colour and stood it against the garage wall at the back of our garden, it would go a long way towards helping to brighten up what was a dull brick wall with a dull brown door. I have wanted to make changes to that garage since we moved it, hoping that maybe we could paint it white at some point just to brighten it up. This however was a much better option, we could paint the garage door the same colour as the pallet which would just lift the whole thing! After sanding the pallet to get rid of all the splintery bits, Mr W&W made some shelves out of MDF he had laying around in his garage. After attaching them to the pallet we where able to finish painting it and move on to painting THAT (much hated) garage door. Again, I say "we" but very little was done by, me as just a couple of minutes of helping to paint wore me out. 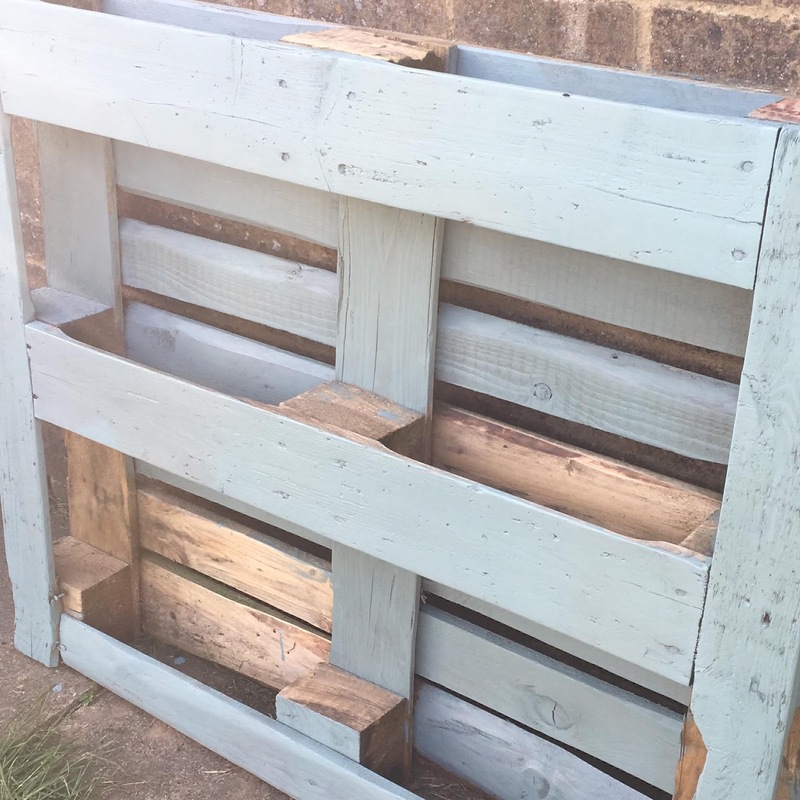 It was decided by The Mr and my Dad (never one to miss out on helping with a bit of DIY) that it would be easy to mount the pallet on the wall rather than just have it stood on the ground. So my Dad joined the team and I made cups of tea whilst keeping Hooper (our dog) from under their feet. It has injected some much needed colour, and I no longer feel like our tiny garden is dominated my an ugly brown garage. We won't need to paint the wall anymore, this has done the trick. Even on some of the greyest stormy days we've had recently it has still looked bright and cheery out there! I'm so pleased with it, especially saying goodbye to the brown door! It's all down to Mr W&W with some help from my dear Dad. All it cost us was the tin of outdoor paint everything else was recycled. There's still plenty to tackle in our garden but bit by bit it's becoming a lovely space to sit with a cup of tea and admire nature. Here's hoping we all get some lovely Summer weather! Waiting for spring and warmer weather to arrive can seem like am awfully long wait. I find winter really drags on after the festive period. Having flowers and plants in my home at this year really helps to bring in some colour and life, a nice contrast to all the bare trees outside and the often grey weather. Spring is just around the corner and I'm eager to start getting the spring feeling in my home as soon as possible! Now I'm not great at looking after houseplants, I never seem to get it right and they often die on me, but I keep trying and I think I'm getting better.....slowly. I adore the first bunches of tulips I have in the house each year and the same goes for daffodils, they instantly bring spring in to your home even when it's still trying to snow outside! I love having a big vase full, but keeping a few back to dot around the house in little bottles, jars and mugs makes them go further. I also bring out my set of wildflower coasters at this time of year. They are available to buy on my website here. The white metal flower pot is also available on my website here. I'm a big fan of drying my hydrangeas each year and then using them all year round. They dry so beautifully and I'm never without flowers that way, even when I have no fresh ones. Adding some greenery with house plants or a jug of eucalyptus also seems to freshen up the house. Displaying floral images or pressed flowers in frames is another way to introduce nature in to your home and would be perfect for anyone who doesn't want the hassle of caring for plants or is allergic to having flowers in the home. The handmade Snowdrop picture is from our Woof & Wilson Designs collection and is available on my website. I bought myself some potted hyacinth bulbs a few week ago to stand on my dining table. They grew so well, (amazing in my house) and apart from looking beautiful, they smell divine! I'm hoping my little jug of daffodil bulbs will be just as successful this year as they have the past couple of years. You can find many of the homewares shown in these photos on my website, including the hanging white frames, the wicker heart, the rustic hooks with hanging jars, and the "Bee happy!" picture, another one of our Woof & Wilson designs. Pop over to The Cosy Corner House website if you want to shop the look. Try bringing a little nature in to your home and have fun with it! Have you seen the latest products we have in stock? There are some beautiful new homewares just perfect for dressing your home for the summer. From gorgeous kitchen & dining items to stylish storage baskets, and some stunning vases for your seasonal blooms! These baskets come in three sizes and have the most gorgeous rose coloured sequins on the bottom half. Storage at its prettiest! Our new paddle/chopping boards are proving very popular for your kitchens this summer. Both the mini two tone marble & wood board and the aged French wood board have a wonderful rustic country kitchen feel to them, but would be equally as at home in a contemporary kitchen. Our cutest new addition to the shop has to be our little brass snail spoons. 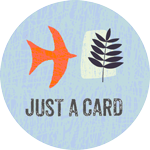 Utterly adorable and a perfect little gift, particularly for those of us who are nature lovers! Use our beautiful new ribbed glass jar, handmade by artisans from recycled glass to serve your summer drinks in style, or even to hold some flowers! If you are looking for a vase then look no further than our stunning large glass vase, beautifully shaped to hold your big summer bouquets! As for your smaller flower pickings, our wildflower jars are extremely popular. With a rustic mesh lid that rests on top of the vase it's perfect for holding those more delicate wildflowers. I love filling mine with lavender from my garden too! Summer trips to the market, shops or the beach wouldn't be complete without our gorgeous French market style shopping basket. They are hand woven with plenty of room in them and long leather handles for carrying. Bring on the sunshine! As for some lovely finishing touches around your home, you don't have to wait until Autumn to start lighting candles. I love to have candles lit during summer evenings both inside the house or out in the garden. The stunning square glass and antique brass candle holder is perfect for adding some cosiness to your home, whilst the top can be removed so that you can create a display inside it. I'm personally very excited about all the styling possibilities throughout the seasons, from filling it with dried flowers and foliage, to pine cones and pumpkins! We also have some new little hanging glass tealight holders. They have been handmade and have a gorgeous hammered glass effect. They would look wonderful outside in the garden! Finally we have some lovely new frames in stock, distressed white wooden hanging frames and antique brass hanging frames. Both designs have a glass front and back. They look wonderful with photos in them but you can also frame pressed flowers or mementos such as tickets or postcards. Have fun with them! Grab yourself a cup of tea and have a browse of our website to see these and many more beautiful homeware and gifts. We hope you love our new products as much as we do. Have a lovely week!